An unspoiled gem hidden near the borders of Tuscany, Umbria and Lazio, Soriano nel Cimino displays all the antiquated charm of an authentic Italian village. 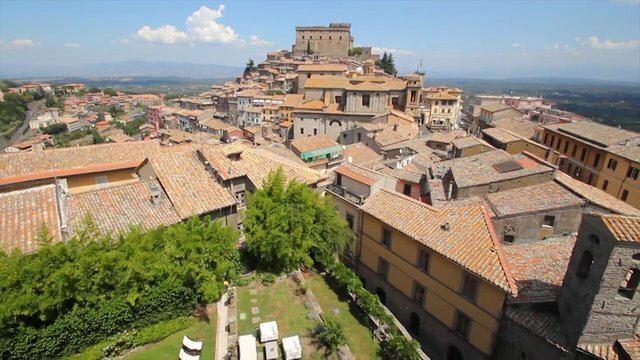 This stunning destination provides seclusion from the buzzing tourist hub of Tuscany, yet offers a gateway to the countryside with easy access to popular attractions. Delight in the simplicities of life; visit the mom-and-pop shops, frequent the vegetable stands for fresh daily produce or dine in the trattorias along Soriano’s winding, cobblestone streets. Discover medieval villages, castles and historic churches dating back to the Renaissance.The regal 17th-century building of Palazzo Catalani exhibits the distinguished allure of Italian architecture and design. Once the mansion of a nobleman, this charming estate now offers an idyllic retreat in the delightful medieval village of Soriano nel Cimino. Though the resort maintains many of its original historic appointments, the sizable accommodations feature a partial kitchen with modern amenities for the utmost in comfort and convenience. Relax amid the resort’s well-manicured gardens, or spend the afternoon in the library with a good book. Our stylish club suites features a double or twin size bed and in some units a sofa bed. The well-appointed compact bathroom includes a complimentary amenity kit, heated towel rack and hair dryer. Enjoy the partially equipped kitchen with microwave, refrigerator, toaster and coffee maker among other modern appliances. Relax in our tasteful living space with flat screen television and DVD player. Additional amenities include telephone, safe and alarm clock. Our stylish studio accommodations feature a double or twin size bed and in some units a sofa bed. The well-appointed compact bathroom includes a complimentary amenity kit, heated towel rack and hair dryer. Enjoy the partially equipped kitchen with microwave, refrigerator, toaster and coffee maker among other modern appliances. Relax in our tasteful living space with flat screen television and DVD player. Additional amenities include telephone, safe and alarm clock. Our stylish 1 bedroom accommodations feature a double or twin size bed and in some units a sofa bed. The well-appointed compact bathroom includes a complimentary amenity kit, heated towel rack and hair dryer. Enjoy the partially equipped kitchen with microwave, refrigerator, toaster and coffee maker among other modern appliances. Relax in our tasteful living space with flat screen television and DVD player. Additional amenities include telephone, safe and alarm clock. Directions to Resort: (From Fiumicino Airport) Follow the green signs towards Rome and join the Fiumicino-Roma E80 motorway for about 6km/3.5 miles. Leave the E80 at the FIRENZE A1 exit and head north for approximately 30km/18 miles until you reach the FIRENZE-A1 exit. Join the FIRENZE A1/E35 motorway heading north for around 16km/10 miles at which point the motorway will become the FIRENZE A1 toll road. Stay on the toll road until you get to the ORTE exit (around 35 minutes). As you exit the tollroad you must pay the €3.80 toll charge (please DO NOT use the TELEPASS lanes to pay the fare). Once you have left the toll booth immediately turn left and you will soon be on the SS204 four-lane expressway heading to Viterbo. Stay on the expressway and exit at SORIANO-CHIA and follow the blue signs that indicate Soriano. Approximate time of journey from airport to resort 90 minutes. Once you have entered the village, you should follow the main road on your left and then the signs for “Centro – Municipio”. You’ll find a round square with a fuel station on your right. Take the left street climbing up and after crossing the Main Square ”Piazza Vittorio Emanuele II”, where you can see the church on the right side, please pay attention: don’t go straight on, but take the right fork “Via Garibaldi”, that unfortunately isn’t so much visible. The resort is on the second street on the left “Via Montecavallo”. You cannot reach the resort by car, but you can leave the car on a parking space in front of “Via Montecavallo”. You can walk up to the resort (20m) and a porter (available only on Saturday) will come down to pick-up your suitcases and show you where the free car park is. Because of special events going on in the town centre in certain time of the year, alternative directions may be needed. Please contact the resort. Directions to Resort: (From Ciampino Airport) Follow the green signs towards Rome and join the GRA (Grande Raccordo Anulare/Ring Road) and head north following directions to FIRENZE A1. Stay on the GRA for approximately 30km/18 miles until you reach the FIRENZE-A1 exit. Join the FIRENZE A1/E35 motorway heading north for around 16km/10 miles at which point the motorway will become the FIRENZE A1 toll road. Stay on the toll road until you get to the ORTE exit (around 35 minutes). As you exit the tollroad you must pay the €3.80 toll charge (please DO NOT use the TELEPASS lanes to pay the fare). Once you have left the toll booth immediately turn left and you will soon be on the SS204 four-lane expressway heading to Viterbo. Stay on the expressway and exit at SORIANO-CHIA and follow the blue signs that indicate Soriano. Approximate time of journey from airport to resort 90 minutes. Once you have entered the village, you should follow the main road on your left and then the signs for “Centro – Municipio”. You’ll find a round square with a fuel station on your right. Take the left street climbing up and after crossing the Main Square ”Piazza Vittorio Emanuele II”, where you can see the church on the right side, please pay attention: don’t go straight on, but take the right fork “Via Garibaldi”, that unfortunately isn’t so much visible. The resort is on the second street on the left “Via Montecavallo”. You cannot reach the resort by car, but you can leave the car on a parking space in front of “Via Montecavallo”. You can walk up to the resort (20m) and a porter (available only on Saturday) will come down to pick-up your suitcases and show you where the free car park is. Kennel: Pensione Cani Amici, 0039 0761 743046; 5km from resort. Shops hours from 8:30-13.00 and 17:00-20:00 in summer and 16:00-19:00 in the winter. We invite you to dine with us on site at Palazzo Catalani Restaurant. Step into the warm and welcoming atmosphere of this family friendly restaurant featuring a full entertainment program and an eclectic menu that is sure to satisfy everybody´s appetite. Savoury dishes and delicious snacks are available for dining in, or for take away. Are you celebrating a special occasion? Palazzo Catalani Restaurant would love to help you make your day memorable. And if you wished to discover how the real Italian food is prepared, join our chef and experience a real Italian cooking course. Call us on +39 (0) 761 744 030 today! A porter will collect your luggage from your vehicle. Please park at the bottom of Via Montecavallo and walk to reception. The resort is positioned on a steep hill with many steep steps and various gradients and inclines around the resort and surrounding area. Some areas of the resort and surrounding area may not be accessible for wheelchair users. Located on ground floor with front door access and manual doors. The Lounge Bar is located next to Reception on the ground floor. To reach the Restaurant, go down one flight of stairs from the Lounge Bar and out the door into the garden and turn right, or there is outdoor access to the Restaurant a few feet from the resort entrance. Entertainment is held at the Restaurant. Located on the first floor of the resort and accessible by climbing two flights of stairs. Conveniently located across the street from the Reception and easily accessible by ramp located at the outdoor entrance next to the hall entrance. Area is furnished with treadmills, mini weight room, aromatic showers, sauna and whirlpool. The whirlpool has some steps and the sauna is not accessible by wheelchair. Down the street with a 15-minute time limit, one accessible parking bay. Complimentary parking with two accessible parking bays and underground parking (daily charge) located a short distance from the resort. Underground parking is not accessible to the mobility impaired. We offer one accommodation in total: 1 studio. Not all ground floor accommodation is suitable for guests with mobility impairments as there are a lot of steps leading to the entrance, steps leading onto terrace/balcony and indeed other resort areas. There are varying levels and floors throughout the resort and there are no lifts/elevators within the accommodation blocks. Chef Roberto will guide our guests for a unique experience preparing bread, pizza, egg handmade pasta and cheese in his kitchen. This tour is an extraordinary tasting of all the wines in a local cellar, followed by a light lunch with typical produce from the area.